Cryptocoryne wendtii is one of the most popular, and widely available aquatic plants in the aquascaping hobby. It has several color variations, and it can be found in green, red and brown colors. The size and texture of the leaves can vary greatly. This plant was originally native to Sri Lanka. It is commonly found in streams and rivers throughout Sri Lanka, and it tends to grow in shaded areas. In a few days, after placing your plants in the aquarium you will notice some of the leaves start to melt and fall away. This means the transition process has started. Please note the plants might look DEAD, but they are fully alive, so do not panic. After a few days you will notice new growth will appear and the plant will fully change its form into submersed growth. Continuous trimming and fertilization is needed for the plants to thrive in your aquarium. 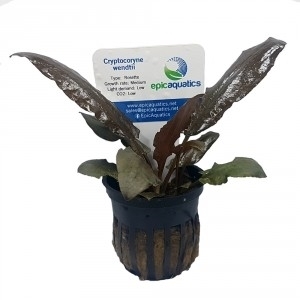 All plants have specific needs but if you follow the general instructions on our labels the plant will transition well and will eventually succeed and prosper in your aquarium.